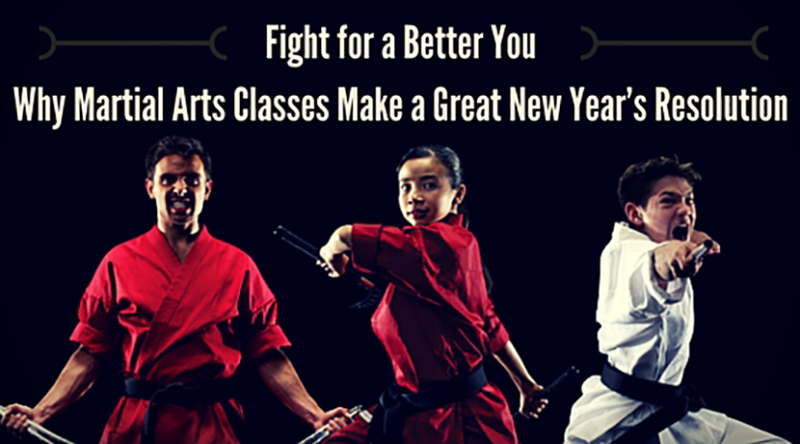 Fight for a Better You: Why Martial Arts Makes a Great New Year’s Resolution - The Macho Blog. Tired of writing an extensive list of resolutions that you’ll never be able to stick to? This year, improve your wellbeing by thinking outside of the box and sign up for a martial arts class! Although this may seem like an unconventional way to achieve your fitness resolutions, martial arts is a great way to improve your wellbeing on multiple levels, including increasing self-confidence, gaining self-defense skills, increasing focus and having higher physical fitness. If you are attending your first martial arts class or pushing yourself to train harder this year, then you are already on your journey to building a better, stronger, more confident you. It takes courage to enter a dojo and interact with instructors and students who are on a similar path as you. It takes courage to spar, train and compete with fellow martial artists. Through your training you will condition yourself to take on challenges and face your fears inside the dojo and in your everyday life. Having confidence in your safety and wellbeing is an invaluable trait to carry with you. Learn tactics to defend yourself if you’re ever in a position that calls for it. Chances are most attackers do not hold any formal training and will therefore not be prepared for the strikes and kicks you’ll be able to throw at them. Surprise yourself with the power that is within you, the power that a martial arts class will reveal. Accuracy training is a big part of martial arts classes. You must learn distance, balance, and form while making sure to strike places that will count in a sparring match all while avoiding sensitive areas. Through this intensive focus and precision you will begin to feel a deeper connection to the movements of your body. This focus training will also benefit your wellbeing outside of the class. You’ll find yourself feeling more centered and intone with your body and mind. Your concentration will improve as well as your posture and balance. Improved posture and balance are just some of the physical benefits you’ll start noticing. Many have lost weight through their training all while having fun. Martial arts classes are a lot more exciting than mundane visits to the gym. You’ll be interacting with others, throwing punches, learning forms, and doing all sorts of different movements and tricks. You’ll want to stick to your training, because of how much fun you’ll have!